Received: June 4, 2018; Revised: August 24, 2018; Accepted: August 31, 2018; Published online: October 26, 2018. Ginger, one of worldwide consumed dietary spice, is not only famous as food supplements, but also believed to exert a variety of remarkable pharmacological activity as herbal remedies. In this study, a ginger constituent, 12-dehydrogingerdione (DHGD) was proven that has comparable anti-inflammatory activity with positive control 6-shogaol in inhibiting LPS-induced interleukin (IL)-6, tumor necrosis factor (TNF)-α, prostaglandin (PG) E2, nitric oxide (NO), inducible NO synthase (iNOS) and cyclooxygenase (COX)-2, without interfering with COX-1 in cultured microglial cells. Subsequent mechanistic studies indicate that 12-DHGD may inhibit neuro-inflammation through suppressing the LPS-activated Akt/IKK/NF-κB pathway. Furthermore, 12-DHGD markedly promoted the activation of NF-E2-related factor (Nrf)-2 and heme oxygenase (HO)-1, and we demonstrated that the involvement of HO-1 on the production of pro-inflammatory mediators such as NO and TNF-α by using a HO-1 inhibitor, Zinc protoporphyrin (Znpp). These results indicate that 12-DHGD may protect against neuro-inflammation by inhibiting Akt/IKK/IκB/NF-κB pathway and promoting Nrf-2/HO-1 pathway. Oxidative stress and neuro-inflammation result in numerous neurodegenerative diseases of the central nervous system (CNS), such as Alzheimer disease, Parkinson’s disease, and Multiple sclerosis (Teismann et al., 2003; Infante-Duarte et al., 2008; Piirainen et al., 2017). The hallmark of neurodegenerative diseases is the persisting activation of microglia, and accumulation of pro-inflammatory factors, including NO, PGE2, IL-6, and TNF-α (Akiyama et al., 2000). Microglia, type of neuronal support cells, they play a major role in immune defense of CNS by acting as macrophages, and many nonimmune tasks of brain (Glass et al., 2010). However, increasing evidence showed that uncontrolled microglia may promote neuronal cells death by secreting numerous neurotoxic factors, including NO, PGE2, IL-6, and TNF-α, and induction of these pro-inflammatory mediators occurs in response to external stress signals through transcriptional factors, including NF-κB, AP-1, and members of the STAT family (Dendorfer et al., 1994; Glass et al., 2010; Villarino et al., 2017). For example, NF-κB, a classical signaling molecule that modulates immune response, cell survival (Mattson and Meffert, 2006), is normally sequestered in the cytosol in its IκB-bound inactivated form. When the inflammatory response occurs, the IKK complex is activated and catalyzes the phosphorylation of IκB. Then, phosphorylated IκB is degraded, and free NF-κB is released to localize to the cell nucleus and induce inflammatory gene expression (Zandi et al., 1997). Thus, inhibition of the NF-κB pathway may be a potential basis for protecting against microglial activation-related diseases in CNS. Multiple classes of food supplements or phytochemicals have been experimentally used as effective protectors against neuro-inflammation (Choi et al., 2011). A well-studied natural dietary ingredient, ginger rhizome (Zingiber officinale Roscoe), it is not only used as edible spice in the world, but also a well-known medicinal herb due to its multiple pharmacological and physiological properties, such as its anti-inflammatory, analgesic, anti-tumor, anti-diabetes, and anti-microbial effects (Young et al., 2005; Pan et al., 2008; Park et al., 2008; Tan et al., 2013; Rahmani et al., 2014; El-Ashmawy et al., 2017). Ginger contains a lot of compounds, but its biological functions mainly attributed to pungent compounds including the 6-, 8-, and 10-series gingerols and many dehydrated analogues of gingerols such as shogaols, paradols, gingerdiols, and dehydro-gingerdiones (Grzanna et al., 2005). These bioactive compounds share an aromatic ketone moiety with different lengths of the alkyl side chain and substitution pattern on the side chain. Based on a structure-function relationship analysis, the carbon chain length plays a significant role in the antioxidative activity of the gingerols, and the unsaturated ketone moiety exhibits the more potent anti-oxidative and anti-inflammatory properties (Dugasani et al., 2010). Recently, a well-studied pungent compound, 6-shogaol, showed outstanding performance with anti-oxidative, anti-inflammatory, anti-cancer effects (Dugasani et al., 2010; Ha et al., 2012). In addition, a more recent study showed that 6 and 10-dehydro-gingerdiones from ginger also exhibit extremely high anti-oxidative and anti-inflammatory activities like 6-shogaol (Lee et al., 2012; Li et al., 2012). Thus, the other structurally similar compounds in ginger root, 12-dehydrogingerdione (DHGD), which has potentially beneficial effects, but it has not been extensively studied. To our knowledge, there is limited information pertaining to the anti-inflammatory effects of 12-DHGD in LPS-induced RAW 264.7 cells through inhibition of NO, IL-6, and PGE2 without affecting TNF-α and IL-1β (Han et al., 2013). Moreover, the anti-inflammatory mechanism of 12-DHGD has not been elucidated, and whether 12-DHGD inhibits proinflammatory factors, such as TNF-α in neuro-inflammatory model remains unknown. Consequently, the objective of this study was to evaluate the anti-neuroinflammatory properties and mechanism of 12-DHGD in Lipopolysaccharide (LPS)- activated microglial model. All primary and secondary antibodies were purchased from Cell Signaling Technology (Beverly, MA, USA), including iNOS, COX-1, COX-2, IKKα, IKKβ, p-IKKα/β, IκBα, p-IκBα, NF-κB, p-NF-κB, p-Akt (Thr308), p-Akt (Ser473), Akt, HO-1, Nrf-2, LiminB1, and GAPDH. Lipopolysaccharide (Escherichia coli 055:B5) and other reagents were produced by Sigma-Aldrich (St. Louis, MO, USA). Fresh gingers were collected from a greenhouse at the herbarium of the Korea Research Institute of Chemical Technology (KRICT) and authenticated by Dr. Hong Kyung Sik of KRICT, and a voucher specimen (KR0011) was deposited at the herbarium of KRICT. 12-DHGD was obtained from the ginger extract by the procedure described (Koh et al., 2009). Briefly, ginger extract of 1.3 kg was prepared by extracting 12 kg of dry ginger with 24 L methanol at room temperature for one week. The extract was concentrated under reduced pressure to give 1.2 kg of dark syrupy ginger extract, which was immediately suspended in 20 L distilled water and extracted with an equal volume of dichloromethane (CH2Cl2) to yield 552 g CH2Cl2 soluble fraction (200 g) was subjected to silica gel (2 kg) column chromatography by the manner of gradient elution with n-hexane/ethylacetate (10:1 to 0:1) to yield five fractions (Fr. 1-Fr. 5), respectively. The Fr. 2 was further purified by repeated silica gel column chromatography and ODS column chromatography, which finally resulted in the purification of 12 mg of 12-DGHD. BV-2 cells were gift from Professor Sung Joong Lee of Seoul National University, and maintained in F12 DMEM (Gibco, Grand Island, NY, USA) with 5% heat-inactivated fetal bovine serum (FBS, Gibco, USA) and 1% penicillin/streptomycin (Gibco) at 37°C in a 5% CO2 humidified incubator. For the measurement of cell viability in accordance with previous work (Zhao et al., 2017), BV-2 cells of 2.5×104 cells/well were seeded in 96-well plates for 24 h, and treated with the indicated concentrations of 12-DHGD with or without treatment of 100 ng/mL LPS for 12 h. Then, cell viability was measured using the EZ-CyTox Colorimetric cell viability assay reagent (DAEILLAB Co. Ltd, Seoul, Korea) at 37°C for 30 min. The absorbance was measured at 450 nm using micro-plate reader (BIO-TEK@ Dower Wave XS, Winooski, VT, USA). All experimental procedures and mouse care were conducted in compliance with the Korea Institute of Science and Technology (KIST) Animal Care and Ethics Committee Guidelines. Primary microglia were isolated from the cortices of 1 or 2 day-old C57BL/6N mouse pups as described previously (Giulian and Baker, 1986). The brain cortex was removed and cut into 1 mm3 fragments, and tissues were dissociated by mechanical trituration. The cell suspension was filtered through a 40 µm cell strainer, and seeded into T75 culture flask in DMEM with 10% FBS for 2 weeks. Primary microglia were collected by gently shaking, and purity (>95%) was identified with Ionized calcium binding adaptor molecule (Iba)-1 maker using confocal fluorescence microscopy (Leica, Solms, Germany). BV-2 cells were seeded at 5×105 cells/well into 6-well plates, cultured for 24 h, and treated with indicated concentrations of 12-DHGD in the presence or absence of LPS (100 ng/mL) for 12 h. For measuring NO production as described previously (Zhao et al., 2017), briefly, the culture medium was removed, and centrifuged at 13000 rpm to eliminate cells. A total of 50 µL of each culture medium was reacted with 50 µL mixed Griess reagent (1% sulfanilamide, and N-(1-Naphthyl)-ethylenediamine dihydrochloride in 2.5% H3PO4) and incubated at room temperature for 10 min under dark. NaNO2 (0-100 µM) was used as standard, and all samples were measured at 540 nm using micro-plate reader. RT-PCR was performed according our previous study (Zhao et al., 2017). Briefly, Total RNA was extracted and quantified using TRIzol reagent and a NanoDrop 1000 system (Thermo Fisher Scientific Inc., Lafayette, CA, USA), respectively. Then, mRNA of 5 µg was converted to cDNA using a Superscript Ш reverse transcriptase kit according to the manufacturer’s instructions. All target DNA bands were amplified with 2 µL of primer pairs (IL-6 sense: CCACTTCACAAGTCGGAGGCTT and anti-sense: CCAGCTTATCTGTTAGGAGA; iNOS sense: CCCTTCCGAAGTTTCTGGCAGCAGC and anti-sense: GGC TGTCAGAGCCTCGT GGCTTTGG; GAPDH sense: TGATG ACATCAAGAAGGTGGTGAAG and anti-sense: TCCTTGGA GGCCATGTAGGCCAT) and 2 µL of cDNA template mixed with 10 µL of Novelzyme Taq Plus Premix (Noble Bio, Suwon, Korea), then cDNA was separated by electrophoresis on 1.5% agarose gels and stained using ethidium bromide buffer for 30 min. The intensity of the PCR product was measured using an i-MAX Gel Image Analysis System (CoreBio System, Seoul, Korea). The culture medium was collected from 6-well plates, and centrifuged at 13000 rpm. PGE2, IL-6, and TNF-α were quantified using ELISA kits from R&D Systems Inc. (Minneapolis, MN, USA) according to the manufacturer’s instructions. Cell-free IKKα and IKKβ kinase activity was measured using IKK Kinase Enzyme System of Promega (Madison, WI, USA) in accordance with manufacture’s protocol. DNA-binding activity was measured using NF-κB and Nrf-2 Transcription Factor Assay Kits from Abcam (Cambridge, UK) in accordance with manufacturer’s protocol. NF-κB and Nrf-2 translocation were evaluated according our previous method (Zhao et al., 2017). Briefly, cells were fixed using 3.8% p-formaldehyde for 20 min at room temperature, and the cell membranes were permeabilized by 0.5% Triton X-100 in cold PBS for 30 min and then blocked for 30 min with 5% BSA prepared in 0.1% Tween 20 (PBST). Afterward, Cells were then incubated at room temperature for 2 h in a 5% BSA solution that contained specific primary antibodies (1:100). After washing, Alexa Fluor 488-labeled IgG secondary antibody (Invitrogen, CA, USA) was added at 1:200 dilution in 5% BSA solution for 1 h, and then incubated under dark. After that, cells were stained with 25 µg/mL of 4′-6-diamidino-2-phenylindole (DAPI) in PBST, examined by confocal fluorescence microscopy. BV-2 cells of 5×105 cells/well were seeded at into 6-well plate, and cultured for 24 h, and treated with indicated concentrations of 12-DHGD and LPS (100 ng/mL) for 12 h. Cells were collected and lysed according our previous method (Zhao et al., 2017) with lysis buffer (CST) mixed 1× protease inhibitor cocktail (PIC, Roche, Penzberg, Germany) and 1× PMSF. The concentration of total protein was quantified using the Bradford reagent (Bio-Rad, Hercules, CA, USA), and purified BSA as the standard. Additionally, nuclear extract of the cells was isolated using the nuclear extract kit (Thermo Fisher Scientific Inc.) according to the manufacturer’s protocol. The protein was separated by 8% or 10% SDS-PAGE and transferred to polyvinylidene difluoride (PVDF, Millipore, USA) membranes, which were blocked with 5% BSA and incubated with specific primary antibodies at 4°C overnight. After washing with TBST, HRP-conjugated IgG secondary antibodies were added for 1 h incubation at room temperature. The blots were determined using ECL reagents (Thermo Fisher Scientific Inc). Quantification of protein bands was analyzed using LAS4000 system (Fujifilm, Tokyo, Japan). 12-DHGD was identified by NMR: 1H-NMR (CDCl3, 300 MHz) δ 7.50 (1H, d, J=15.8 Hz), 7.05 (1H, d, J=8.1 Hz), 6.99 (1H, s), 6.90 (1H, d, J=8.1 Hz) 6.33 (1H, d, J=15.8 Hz, H-2), 5.61 (1H, s), 3.89 (3H, s, −OCH3), 2.35 (2H, s), 2.58 (2H, t, J=7.6 Hz, m), 1.63 (2H, m), 1.20 (16H, m), 0.87 (3H, t, J=6.6 Hz); 13C-NMR (CDCl3, 125 MHz) δ 200.2, 178.1, 147.8, 146.9, 139.9, 127.6, 123.4, 120.4, 114.9, 109.5, 100.1, 55.8 (− OCH3), 40.1, 31.9, 29.4–29.3 (6C), 25.6, 22.6, 14.1. Chemical structure of 12-DHGD was shown in Fig. 1A, and cell viability was measured after treatments with various concentrations and treated times of 12-DHGD in the presence or absence of LPS during 12 h. As shown in Fig. 1B, 12-DHGD in the presence and absence of LPS did not have a significant effect on microglial viability at 10 µM, while high concentrations of 12-DHGD significantly induced cytotoxicity. Subsequently, to determine the effect of 12-DHGD on neuro-inflammatory responses, and maximum concentration of 10 µM was used. We determined pro-inflammatory cytokines such as TNF-α and IL-6 in LPS-activated BV-2 microglia. The secretion of both TNF-α and IL-6 in culture medium supernatant were measured using ELISA kits, and Fig. 1C and 1D showed that LPS-induced cytokines are dose-dependently suppressed by treatment with 12-DHGD. Compare to a positive control 6-shogaol, 12-DHGD is more efficient in inhibiting the secretion of TNFα and IL-6. Compared to a previous study that TNF-α was not inhibited by treatment with 12-DHGD in RAW 264.7 cells (Han et al., 2013), the difference may depend on the cell species or treatment concentration of 12-DHGD. The other pro-inflammatory mediators, including NO, PGE2, iNOS, and COX-2 were also determined in LPS-activated BV-2 or primary microglial cells. The production levels of LPS-induced NO and PGE2 in supernatants were evaluated using Griess reagents and ELISA, respectively. As shown in Fig. 2A and 2C, the production of NO and PGE2 was markedly suppressed by treatment with 12-DHGD in a dose-dependent manner. Because LPS-induced NO and PGE2 are synthesized and regulated by iNOS and COX-2, respectively, which are inducible enzymes, we determined the effects of 12-DHGD on LPS-induced iNOS and COX-2 enzymes. As shown in Fig. 2B and 2D, the expression of iNOS and COX-2 was also significantly suppressed by pretreatment with 12-DHGD. Additionally, Fig. 2A and 2B also showed that 12-DHGD inhibits NO production and iNOS expression in LPS-activated BV-2 and primary microglial cells in dose-dependent manner. To further understand the mechanism involved in the suppression of PGE2, we also investigated another up-regulator of PGE2, COX-1, which is constitutively expressed in normal tissues. As Fig. 2E showed that 12-DHGD did not inhibit the expression of COX-1 in LPS-activated BV-2 microglia. Moreover, we tried to measure the mRNA expression of IL-6 and iNOS, both of which were inhibited by treatment with 12-DHGD (Fig. 2F). These results suggest that 12-DHGD not only inhibits LPS-induced NO production, PGE2, iNOS, COX-2, and also significantly reduces mRNA expression of IL-6 and iNOS. The NF-κB transcription factor play an important role in regulating the production of pro-inflammatory mediators and cytokines (Baeuerle and Henkel, 1994; Karin and Delhase, 2000). Thus, we investigated the effects of 12-DHGD on transcription factor NF-κB in LPS-activated BV-2 microglia. NF-κB phosphorylation in the nucleus was significantly induced by treatment of LPS, and suppressed by treatment with 12-DHGD, as shown in Fig. 3A. To visualize the translocation of NF-κB, we examined the nuclear translocation of p65-NF-κB from cytoplasm to nucleus in BV-2 cells by immunofluorescence, and found that LPS stimulated NF-κB accumulation (green fluorescence) in the nucleus, this process was clearly reversed by treatment with 12-DHGD, as shown in Fig. 3B. Additionally, because the NF-κB-DNA binding activity is essential for its basic function as a transcription factor, we measured the effect of 12-DHGD on the LPS-induced DNA-binding activity of NF-κB using a transcription activity kit (Abcam). 12-DHGD significantly reduced the NF-κB-DNA binding activity, compared to the LPS-promoted NF-κB-DNA binding activity shown in Fig. 3C. These results suggest that pre-treatment with 12-DHGD not only inhibits the phosphorylation and translocation of NF-κB, but also down-regulates the DNA binding ability of NF-κB. Because the PI3K/Akt signaling pathway is necessary for efficient of NF-κB activation and subsequent expression of NF-κB-regulated inflammatory genes (Sizemore et al., 1999), we examined the effect of 12-DHGD on the PI3K/Akt pathway. As shown in Fig. 4A, LPS significantly induced Akt phosphorylation (Ser473 and Thr308), but this effect was significantly suppressed by treatment with 12-DHGD. Additionally, NF-κB activation is also controlled by sequential phosphorylation, ubiquitination, and degradation of its inhibitory subunit IκB (Mercurio et al., 1997). Therefore, to establish the specific effects of 12-DHGD on regulation of NF-κB signaling pathway in LPS-activated microglial cells, we investigated two up-regulatory mechanism, IκB kinase (IKK) and IκB phosphorylation by western blot. As shown in Fig. 4B, LPS markedly increased the phosphorylation of IKKα/β, which was reduced by treatment with 12-DHGD. Furthermore, LPS-induced IκB phosphorylation and degradation were blocked by treatment with 12-DHGD as shown in Fig. 4C and 4D. In this study, we determined whether 12-DHGD induced the expression of HO-1, which is a mediator of critical cellular response against oxidative stress-induced toxicity and inflammatory responses (Syapin, 2008). As shown in Fig. 5A, compared to the LPS group, 12-DHGD significantly increased the protein expression of HO-1 in LPS-activated BV-2 microglial cells. Subsequently, we detected that up-regulator of HO-1, Nrf-2; expression of Nrf-2 was significantly induced (Fig. 5B) in both nuclear and cytoplasm, and the immunofluorescence data in Fig. 5C show that nuclear Nrf-2 is strongly increased by treatment with 12-DHGD. Furthermore, we found that 12-DHGD significantly promoted the DNA binding activity of Nrf-2, and activated the expression of Nrf-2 after 8 h in a time-dependent manner, as shown in Fig. 5D and 5E. To confirm the involvement of Akt in IKK/IκB/NF-κB signaling pathway, a selective inhibitor of Akt, LY294002 was used to abolish the function of Akt. As shown in Fig. 6A, LY294002 significantly inhibits Akt/IKK/IκB/NF-κB, including the phosphorylation of Akt (Ser 473 and Thr 308), the phosphorylation of IKK, and nuclear NF-κB translocation and phosphorylation. In addition, we found that LY294002 can significantly inhibit the production of NO, and more than 12-DHGD, however, cotreatment LY294002 and 12-DHGD can not significantly reduce NO production compare to LY294002-alone treatment in Fig. 6B. Since IKK is critical kinase for activating the phosphorylation of IκB to release free NF-κB and induce inflammatory gene expression (Zandi et al., 1997). We further detected whether 12-DHGD is an IKK kinase inhibitor or not. The result as shown in Fig. 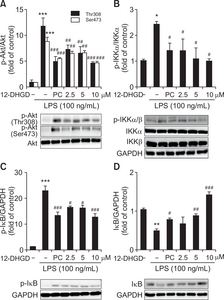 6C that 12-DHGD can significantly inhibit IKK kinase activity. The results indicate that Akt may be a key target for inhibiting inflammatory responses, and the data reveal that the LPS-induced Akt/IKKα/β signaling pathway is effectively suppressed by treatment with 12-DHGD, which leads to the inactivation of NF-κB in BV-2 cells. HO-1 plays a critical role in against the toxicity of oxidative stress and inflammatory responses (Syapin, 2008). The role of HO-1 in the 12-DHGD-mediated anti-inflammatory effect was evaluated, Zinc protoporphyrin (Znpp), HO-1 inhibitor was used for abolished the expression of HO-1. As shown in Fig. 6D and 6E; both NO and TNF-α were significantly increased after abolishing the expression of HO-1. Then, co-treatment with Znpp and 12-DHGD significantly reduced the LPS-induced NO production and TNF-α secretion. Thus, 12-DHGD-mediated HO-1 is also important signaling pathway to attenuate neuro-inflammatory effects. Accumulating evidence suggests that over-activated microglia secrete excessive pro-inflammatory mediators, which can lead to neuro-inflammation and neurodegenerative diseases (Akiyama et al., 2000; Teismann et al., 2003; Infante-Duarte et al., 2008; Piirainen et al., 2017). Therefore, suppression of over-activated microglia may be therapeutically valuable for treatments of neuro-inflammation and related neurodegenerative diseases. Positive control 6-Shogaol, a compound in ginger, has been extensively studied and functions as an in vitro and in vivo neuroprotective agent in a neuro-inflammation model (Ha et al., 2012). In this study, a pungent compound in ginger, 12-DHGD, showed comparable anti-neuroinflammatory effects with 6-shogaol for inhibiting the production of pro-inflammatory mediators, including NO, IL-6, PGE2, TNF-α, iNOS, and COX-2 in LPS-activated microglial cells. It is mentionable that 12-DHGD selectively inhibits the expression of COX-2 without affecting the expression of COX-1. In addition, 12-DHGD also reduce the mRNA expression of IL-6 and iNOS, which are regulated by NF-κB. A mechanistic study, has shown that the NF-κB transcription factor plays an important role in the production of pro-inflammatory cytokines and is believed to be a promising target for the treatment of inflammatory diseases (Tak and Firestein, 2001; Gupta et al., 2010). Thus, the effect of 12-DHGD on the NF-κB pathway was evaluated in LPS-activated BV-2 microglial cells. As Fig. 3 shown that DNA binding activity and phosphorylation of NF-κB in the nucleus were significantly stimulated by LPS, and the effects of LPS were diminished by treatment with 12-DHGD. These data were confirmed by confocal microscopy, where it was evident that 12-DHGD prevented the localization of NF-κB from the cytoplasm to the nucleus. Moreover, 12-DHGD can reduce NF-κB activation by blocking the phosphorylation and subsequent degradation of IκB in Fig. 4. Furthermore, we determined the effect of 12-DHGD on the phosphorylation of IKK; LPS-induced IKK phosphorylation was significantly inhibited by treatment with 12-DHGD. Additionally, our results raised the possibility that 12-DHGD is an IKK kinase inhibitor which consistent with a previous study that 10-DHGD directly inhibited the catalytic activity of IKK with and without the LPS-mediated induction of macrophages (Lee et al., 2012). Furthermore, well-studied Akt is part of a signaling pathway that is necessary for inducing key immune and inflammatory responses (Ozes et al., 1999); in this study, Akt was inhibited in a dose-dependent manner by treatment with 12-DHGD. To confirm 12-DHGD-mediated attenuation of neuro-inflammation via Akt/IKK/NF-κB pathway, specific inhibitors were used to block Akt activation, which resulted in reducing phosphorylated IKK expression, nuclear NF-κB and p-NF-κB, TNF-α, and NO production. These results indicate that the Akt/IKK/NF-κB signaling pathway is an important target for inhibiting the LPS-induced neuro-inflammatory activity of 12-DHGD. Moreover, up-regulation of HO-1 expression is an adaptive and protective response to oxidative injury (Syapin, 2008; Jeong et al., 2016). In this study, we found that 12-DHGD significantly up-regulates the expression of HO-1 in Fig 6. Since previous data have suggested an anti-inflammatory function for Nrf-2, which can inhibit the NF-κB activation and up-regulate HO-1 (Cuadrado et al., 2014). In this study, we detected that 12-DHGD also induces the activation of Nrf-2 in a dose- and time-manner in BV-2 microglial cells. A subsequent mechanistic evaluation showed that 12-DHGD-induced HO-1 significantly contributed to the inhibition of NO and TNF-α by abolishing HO-1 expression. Although PI3K/Akt signaling pathway has been reported to involve in inflammatory and oxidative process via activating both NF-κB and Nrf-2 in various cells, respectively (Wang et al., 2008; Bai et al., 2009). It is interesting that 12-DHGD inhibits the activation of Akt/NF-κB signaling pathway, instead increases Nrf-2/HO-1 expression. Similar to 12-DHGD, there are many famous natural products show similar effects in immune cell, such as curcumin, morin, and schisandrin A (Cianciulli et al., 2016; Jung et al., 2017; Kwon et al., 2018). The main reason may due to difference of cells, and further study would be required. In conclusion, this study demonstrates that 12-DHGD has considerable anti-neuroinflammatory effects toward inhibiting the production of pro-inflammatory mediators, such as IL-6, TNF-α, PGE2, NO, iNOS, and COX-2. The molecular mechanism by which 12-DHGD inhibits neuro-inflammatory responses in microglia is based on 12-DHGD-mediated the regulation of inflammation-related signaling pathways, including inhibition of Akt/IKK/NF-κB, and activation of Nrf-2/HO-1 pathways. This study was supported by the Bio-Synergy Research Project (NRF-2012M3A9C4048793) and the Bio & Medical Technology Development Program (NRF-2015M3A9A5030735) of the Ministry of Science, ICT, and Future Planning through the National Research Foundation, Republic of Korea. Fig. 1. 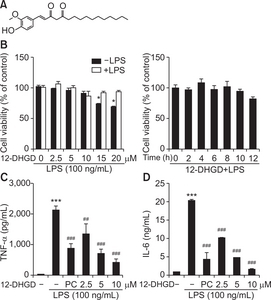 12-DHGD does not affect cell viability, but attenuates the secretion of pro-inflammatory cytokines TNF-α and IL-6 in LPS-activated microglial cells. (A) Chemical structure of 12-DHGD (PC, 6-shogaol), which does not affect the (B) cell viability at indicated concentrations and time-points in the presence or absence of LPS, but significantly and dose-dependently inhibits the secretion of TNF-α (C) and the secretion of IL-6 (D) in LPS-activated BV-2 microglial supernatant. Values are expressed as the mean ± standard error of the mean (SEM) of at least 3 independent experiments. *p<0.05 and="" sup="">***p<0.001 compared="" to="" the="" control="" group="" sup="">##p<0.01 and="" sup="">###p<0.001 compared to the LPS group. Fig. 2. 12-DHGD attenuates the production of NO and PGE2, and the expression of iNOS and COX-2 in LPS-activated microglial cells. Effect of 12-DHGD (PC, 6-shogaol) on the production of NO (A) in the culture supernatant and up-regulator iNOS (B) expression in LPS-activated BV-2 and primary microglial cells. Effect of 12-DHGD on the secretion of PGE2 (C) in the culture supernatant, up-regulator of COX-2 (D) and COX-1 (E) proteins expression, as well as mRNA expression of IL-6 and iNOS in LPS-activated BV-2 microglial cells. Values are expressed as the mean ± SEM of at least 3 independent experiments. *p<0.05, **p<0.01, and ***p<0.001 compared="" to="" the="" control="" group="" sup="">#p<0.05, ##p<0.01, and ###p<0.001 compared to the LPS group. Fig. 3. 12-DHGD inhibits neuro-inflammation by suppressing the NF-κB signaling pathway in LPS-activated microglial cells. 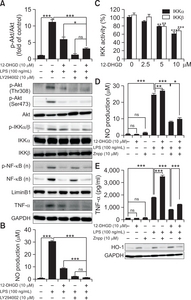 Effect of 12-DHGD on phosphorylation of NF-κB (A) in the cell nucleus (n) and cytoplasmic (c) NF-κB, and nuclear translocation of NF-κB (B) (scale bar=25 μm), (C) NF-κB-DNA binding activity was detected by western blot, immunofluorescence assay and ELISA, respectively. Values are expressed as the mean ± SEM of at least 3 independent experiments. ***p<0.001 compared="" to="" the="" control="" group="" sup="">#p<0.05, ##p<0.01, and ###p<0.001 compared to the LPS group. Fig. 4. 12-DHGD inhibits the NF-κB signaling pathway by suppressing the Akt/IKK/IκB signaling pathway in LPS-activated microglial cells. (A) Effect of 12-DHGD on the phosphorylation of Akt (Thr308 and Ser473), (B) phosphorylation of IKKα/β, (C) phosphorylation of IκB, (D) and up-regulation of IκB in LPS-activated BV-2 microglial cells. Values are mean ± SEM of at least 3 independent experiments; *p<0.05, **p<0.01, and ***p<0.001 compared="" to="" the="" control="" group="" sup="">#p<0.05, ##p<0.01, and ###p<0.001 compared to the LPS group. Fig. 5. 12-DHGD affects neuro-inflammation by regulating the Nrf-2/HO-1 signaling pathway in LPS-activated microglial cells. 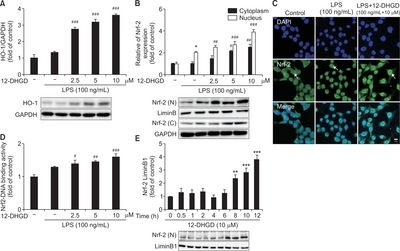 Effect of 12-DHGD on the expression of HO-1 (A) and Nrf-2 (B) in the cell nucleus (n) and cytoplasm (c), and nuclear translocation of Nrf-2 (C) (scale bar=25 μm), and (D) Nrf-2-DNA binding activity was detected by western blot, immunofluorescence, and ELISA, respectively. Effect of the 12-DHGD treatment time on the expression of Nrf-2 (E) in the absence of LPS activated BV-2 cells. Values are expressed as mean ± SEM of at least 3 independent experiments; *p<0.05, **p<0.01, and ***p<0.001 compared="" to="" the="" control="" group="" sup="">#p<0.05, ##p<0.01, and ###p<0.001 compared to the LPS group. Fig. 6. BV-2 cells were pre-treated with specific inhibitor LY294002 for 30 min and co-treated with 12-DHGD for 1 h, followed by cotreatment with 100 ng/ml LPS for 12 h. Phosphorylation of Akt (Thr308 and Ser473), IKK, nuclear (n) NF-κB, and TNF-α (A) was measured by western blot, and NO production (B) was measured using Griess reagents. (C) Cell-free IKKα and IKKβ kinase activity was measured using IKKα/β Kinase Enzyme System, respectively. 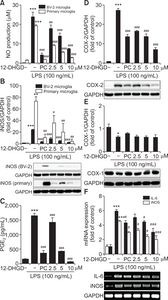 12-DHGD inhibits neuro-inflammation by up-regulating HO-1 in LPS-activated microglial cells. The effect of co-treatment with the HO-1 inhibitor (zinc protoporphyrin, Znpp) on the production of NO (D) and the secretion of TNF-α (E) in LPS-activated BV-2 microglial cells. Values are expressed as the mean ± SEM of at least 3 independent experiments; *p<0.05, **p<0.01, and ***p<0.001 compared to control or indicated group. Akiyama, H, Barger, S, Barnum, S, Bradt, B, Bauer, J, Cole, GM, Cooper, NR, Eikelenboom, P, Emmerling, M, Fiebich, BL, Finch, CE, Frautschy, S, Griffin, WS, Hampel, H, Hull, M, Landreth, G, Lue, L, Mrak, R, Mackenzie, IR, McGeer, PL, O’Banion, MK, Pachter, J, Pasinetti, G, Plata-Salaman, C, Rogers, J, Rydel, R, Shen, Y, Streit, W, Strohmeyer, R, Tooyoma, I, Van Muiswinkel, FL, Veerhuis, R, Walker, D, Webster, S, Wegrzyniak, B, Wenk, G, and Wyss-Coray, T (2000). Inflammation and Alzheimer’s disease. Neurobiol. Aging. 21, 383-421. Baeuerle, PA, and Henkel, T (1994). Function and activation of NF-kappa B in the immune system. Annu. Rev. Immunol. 12, 141-179. Bai, D, Ueno, L, and Vogt, PK (2009). Akt-mediated regulation of NFkappaB and the essentialness of NFkappaB for the oncogenicity of PI3K and Akt. Int. J. Cancer. 125, 2863-2870. Choi, DK, Koppula, S, and Suk, K (2011). Inhibitors of microglial neurotoxicity: focus on natural products. Molecules. 16, 1021-1043. Cianciulli, A, Calvello, R, Porro, C, Trotta, T, Salvatore, R, and Panaro, MA (2016). PI3K/Akt signalling pathway plays a crucial role in the anti-inflammatory effects of curcumin in LPS-acivated microglia. Int. Immunopharmacol. 36, 282-290. Cuadrado, A, Martin-Moldes, Z, Ye, J, and Lastres-Becker, I (2014). Transcription factors NRF2 and NF-kappaB are coordinated effectors of the Rho family, GTP-binding protein RAC1 during inflammation. J. Biol. Chem. 289, 15244-15258. Dendorfer, U, Oettgen, P, and Libermann, TA (1994). Multiple regulatory elements in the interleukin-6 gene mediate induction by prostaglandins, cyclic AMP, and lipopolysaccharide. Mol. Cell. Biol. 14, 4443-4454. Dugasani, S, Pichika, MR, Nadarajah, VD, Balijepalli, MK, Tandra, S, and Korlakunta, JN (2010). Comparative antioxidant and anti-inflammatory effects of -gingerol, -gingerol, -gingerol and -shogaol. J. Ethnopharmacol. 127, 515-520. El-Ashmawy, NE, Khedr, NF, El-Bahrawy, HA, and Abo Mansour, HE (2017). Ginger extract adjuvant to doxorubicin in mammary carcinoma: study of some molecular mechanisms. Eur. J. Nutr. 57, 981-989. Giulian, D, and Baker, TJ (1986). Characterization of ameboid microglia isolated from developing mammalian brain. J. Neurosci. 6, 2163-2178. Glass, CK, Saijo, K, Winner, B, Marchetto, MC, and Gage, FH (2010). Mechanisms underlying inflammation in neurodegeneration. Cell. 140, 918-934. Grzanna, R, Lindmark, L, and Frondoza, CG (2005). Ginger--an herbal medicinal product with broad anti-inflammatory actions. J. Med. Food. 8, 125-132. Gupta, SC, Sundaram, C, Reuter, S, and Aggarwal, BB (2010). Inhibiting NF-kappaB activation by small molecules as a therapeutic strategy. Biochim. Biophys. Acta. 1799, 775-787. Ha, SK, Moon, E, Ju, MS, Kim, DH, Ryu, JH, Oh, MS, and Kim, SY (2012). 6-Shogaol, a ginger product, modulates neuroinflammation: a new approach to neuroprotection. Neuropharmacology. 63, 211-223. Han, YA, Song, CW, Koh, WS, Yon, GH, Kim, YS, Ryu, SY, Kwon, HJ, and Lee, KH (2013). Anti-inflammatory effects of the Zingiber officinale roscoe constituent 12-dehydrogingerdione in lipopolysaccharide-stimulated Raw 264.7 cells. Phytother. Res. 27, 1200-1205. Infante-Duarte, C, Waiczies, S, Wuerfel, J, and Zipp, F (2008). New developments in understanding and treating neuroinflammation. J. Mol. Med. 86, 975-985. Jeong, YH, Park, JS, Kim, DH, and Kim, HS (2016). Lonchocarpine increases Nrf2/ARE-mediated antioxidant enzyme expression by modulating AMPK and MAPK signaling in brain astrocytes. Biomol. Ther. (Seoul). 24, 581-588. Jung, JS, Choi, MJ, Lee, YY, Moon, BI, Park, JS, and Kim, HS (2017). Suppression of Lipopolysaccharide-induced Neuroinflammation by Morin via MAPK, PI3K/Akt, and PKA/HO-1 Signaling Pathway Modulation. J. Agric. Food Chem. 65, 373-382. Karin, M, and Delhase, M (2000). The IκB kinase (IKK) and NF-κB: key elements of proinflammatory signalling. Semin. Immunol. 12, 85-98. Koh, EM, Kim, HJ, Kim, S, Choi, WH, Choi, YH, Ryu, SY, Kim, YS, Koh, WS, and Park, SY (2009). Modulation of macrophage functions by compounds isolated from Zingiber officinale. Planta Med. 75, 148-151. Kwon, DH, Cha, HJ, Choi, EO, Leem, SH, Kim, GY, Moon, SK, Chang, YC, Yun, SJ, Hwang, HJ, Kim, BW, Kim, WJ, and Choi, YH (2018). Schisandrin A suppresses lipopolysaccharide-indcued inflammation and oxidative stress in RAW 264.7 macrophages by suppressing the NF-B, MAPKs and PI3K/Akt pathways and activating Nrf2/HO-1 signaling. Int. J. Mol. Med. 41, 264-274. Lee, HY, Park, SH, Lee, M, Kim, HJ, Ryu, SY, Kim, ND, Hwang, BY, Hong, JT, Han, SB, and Kim, Y (2012). 1-Dehydro--gingerdione from ginger inhibits IKKbeta activity for NF-kappaB activation and suppresses NF-kappaB-regulated expression of inflammatory genes. Br. J. Pharmacol. 167, 128-140. Li, F, Nitteranon, V, Tang, X, Liang, J, Zhang, G, Parkin, KL, and Hu, Q (2012). In vitro antioxidant and anti-inflammatory activities of 1-dehydro--gingerdione, 6-shogaol, 6-dehydroshogaol and hexahydrocurcumin. Food Chem. 135, 332-337. Mattson, MP, and Meffert, MK (2006). Roles for NF-κB in nerve cell survival, plasticity, and disease. Cell Death Differ. 13, 852-860. Mercurio, F, Zhu, H, Murray, BW, Shevchenko, A, Bennett, BL, Li, J, Young, DB, Barbosa, M, Mann, M, Manning, A, and Rao, A (1997). IKK-1 and IKK-2: cytokine-activated IkappaB kinases essential for NF-kappaB activation. Science. 278, 860-866. Ozes, ON, Mayo, LD, Gustin, JA, Pfeffer, SR, Pfeffer, LM, and Donner, DB (1999). NF-kappaB activation by tumour necrosis factor requires the Akt serine-threonine kinase. Nature. 401, 82-85. Pan, MH, Hsieh, MC, Hsu, PC, Ho, SY, Lai, CS, Wu, H, Sang, S, and Ho, CT (2008). 6-Shogaol suppressed lipopolysaccharide-induced up-expression of iNOS and COX-2 in murine macrophages. Mol. Nutr. Food Res. 52, 1467-1477. Park, M, Bae, J, and Lee, DS (2008). Antibacterial activity of -gingerol and -gingerol isolated from ginger rhizome against periodontal bacteria. Phytother. Res. 22, 1446-1449. Piirainen, S, Youssef, A, Song, C, Kalueff, AV, Landreth, GE, Malm, T, and Tian, L (2017). Psychosocial stress on neuroinflammation and cognitive dysfunctions in Alzheimer’s disease: the emerging role for microglia?. Neurosci. Biobehav. Rev. 77, 148-164. Rahmani, AH, Shabrmi, FM, and Aly, SM (2014). Active ingredients of ginger as potential candidates in the prevention and treatment of diseases via modulation of biological activities. Int. J. Physiol. Pathophysiol. Pharmacol. 6, 125-136. Sizemore, N, Leung, S, and Stark, GR (1999). Activation of phosphatidylinositol 3-kinase in response to interleukin-1 leads to phosphorylation and activation of the NF-kappaB p65/RelA subunit. Mol. Cell. Biol. 19, 4798-4805. Syapin, PJ (2008). Regulation of haeme oxygenase-1 for treatment of neuroinflammation and brain disorders. Br. J. Pharmacol. 155, 623-640. Tak, PP, and Firestein, GS (2001). NF-kappaB: a key role in inflammatory diseases. J. Clin. Invest. 107, 7-11. Tan, BS, Kang, O, Mai, CW, Tiong, KH, Khoo, AS, Pichika, MR, Bradshaw, TD, and Leong, CO (2013). 6-Shogaol inhibits breast and colon cancer cell proliferation through activation of peroxisomal proliferator activated receptor gamma (PPARgamma). Cancer Lett. 336, 127-139. Teismann, P, Tieu, K, Cohen, O, Choi, DK, Wu, DC, Marks, D, Vila, M, Jackson-Lewis, V, and Przedborski, S (2003). Pathogenic role of glial cells in Parkinson’s disease. Mov. Disord. 18, 121-129. Villarino, AV, Kanno, Y, and O’Shea, JJ (2017). Mechanisms and consequences of Jak-STAT signaling in the immune system. Nat. Immunol. 18, 374-384. Wang, L, Chen, Y, Sternberg, P, and Cai, J (2008). Essential roles of the PI3K/Akt pathway in regulating Nrf2-dependent antioxidant functions in the RPE. Invest. Ophthalmol. Vis. Sci. 49, 1671-1678. Young, HY, Luo, YL, Cheng, HY, Hsieh, WC, Liao, JC, and Peng, WH (2005). Analgesic and anti-inflammatory activities of -gingerol. J. Ethnopharmacol. 96, 207-210. Zandi, E, Rothwarf, DM, Delhase, M, Hayakawa, M, and Karin, M (1997). The IkappaB kinase complex (IKK) contains two kinase subunits, IKKalpha and IKKbeta, necessary for IkappaB phosphorylation and NF-kappaB activation. Cell. 91, 243-252. Zhao, D, Kwon, SH, Chun, YS, Gu, MY, and Yang, HO (2017). Anti-neuroinflammatory effects of fucoxanthin via inhibition of Akt/NF-kappaB and MAPKs/AP-1 pathways and activation of PKA/CREB pathway in lipopolysaccharide-activated BV-2 microglial cells. Neurochem. Res. 42, 667-677.